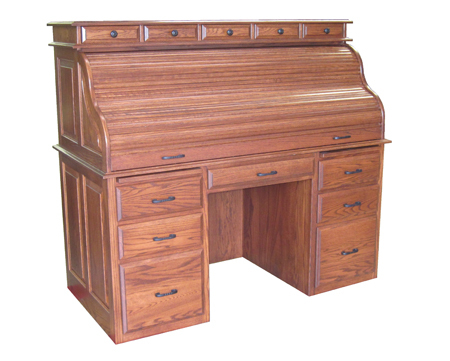 Our 60” Deluxe Rolltop Desk is built to last. It boasts solid hardwood construction with strong, full-extension drawer glides. Even the sliding lid is composed of overlapping wood pieces, held in place with concealed cables inserted through each piece. (Many rolltops have lids made of fabric with wood strips glued to it. In time the fabric tears and the roll top lid is unusable.) Our lid design ensures years of functional use. The sides, front, back, and drawer interiors of our Deluxe Rolltop Desk are fully stained and finished. The panels may be ordered as raised panels or flat panels. Since desks are often placed against a wall, the back of this one has less detail in order to reduce costs. 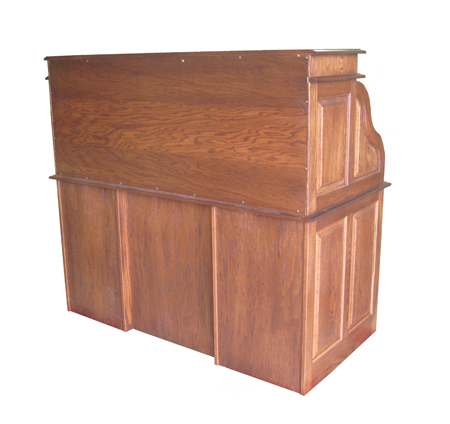 For a rolltop with detail on the back as well, see our Vintage Rolltop desks on page 3.